What areas of my process can I control with this controller? The Z4 is capable of controlling your process at the Unwind, Intermediate/Nip, or Rewind. The controller can control any level of tension. The tension limits, high or low depend primarily on the capacity and resolution of the torque control devices (brake/clutch). The controller has the sensitivity and adjustability to regulate to essentially zero tension, and manage the highest levels of tension with respect to the capacities of the load cells and torque devices. The controller can manage accurate tension control regardless of line speed. The limits are determined by the motor/drive capacities, and ultimately, by the process itself. The controller does not care what speed the machine runs at. It depends. It depends on many factors. Primarily it is the process itself that dictates the best method of control. Processes that require rapid acceleration and/or deceleration respond better to dancer control methods. Indexing, or Start/Stop applications with relatively short dwell or idle times respond better to dancer control due to the web storage capacities that well designed dancer systems afford. Continuous application where on-the-fly splices are utilized, dancer systems again provide necessary web storage for smooth, trouble-free splices. The disadvantage of most dancer systems is that they do not tell you what your actual web tension is. Load cells will indicate the actual web tension to ensure consistent processing. Can I use this controller with an automatic range expander? Yes. The Z4 is compatible with our P-3000 Automatic Range Expander to increase the capabilities of your application. Short run, frequent start/stop applications, or applications where precise tension control is not required. Not necessarily. 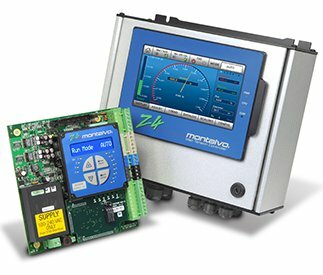 The Montalvo Z4 Controller is a hybrid controller that utilizes analog signal processing for the actual tension control loop, while utilizing a digital interface for programming that simplifies programs and offers many optional features. Analog signal processing is real-time. Digital signal processing is limited by processor clock-speed. While modern processors are extremely fast, none are as fast as analog. That being said, digital processing may be fast enough for many applications. Montalvo offers a fully digital load-cell based system with our S4 system. Calibration can be strictly reserved for when a problem is present. If the system needs more frequent calibration than twice yearly, it could indicate a problem with the load cell system, either mechanical or electrical. However, if you wish to calibrate more often you can do so at your leisure. How do I know if it’s my controller or machine? If a controller is not correctly and consistently managing web tension, and is exhibiting fluctuations, the easiest way to determine if it is the tension control system or some other factor creating the problem is to put the controller into its manual mode. If the tension stabilizes, and becomes more or less constant, this indicates a control loop problem. If there is no or minimal difference in the tension between closed-loop automatic control and manual mode, this typically indicates some mechanical issue in the system such as bad idler roll bearings, surging drives, core slippage or some other mechanical issue. How do I configure my Z4 controller from Unwind to Rewind? The board can be easily reconfigured, but it might be best to send it to us. We will reconfigure, and test the board to verify that it is functioning correctly.